We looked a bit bemused when the Hertz guy gave us a free upgrade last week to a Ford Escape XLT SUV. It’s almost exactly not the car you’d want for long freeway driving. I just did the fuel economy for our trip. It’s not pretty. For the whole trip, we averaged 11.7 l/100km, or 20 mpg (US — that’s 24.1 mpg for UK readers). That means we used over half a cubic metre of petrol. Eek! We’re all gonna die and it’s my fault! Litres / 100 km is a strange unit. If you do a dimensional analysis (L3/L), it ends up being a unit of area. So I’d be quite correct — if a little weird — to say I got a fuel consumption of 1.17×10-7 m2. where are the hybrids for hire? We’re about to hire a car. I’d like to price a hybrid. So I go looking for hybrid rentals. Nada. Well, not quite; Discount said they’d added a bunch of hybrids to their fleet, but they can’t be found on their fleet page. I walk through a Ford dealership every day. When the Escape Hybrid came out, there were a couple in the lot. They seemed to hang around for a while, but now there are none. I guess it was all greenwash after all, ‘cos I see a lot more Mustangs and trucks selling than hybrids. In short, we’re all going to die, and it’s your fault. Author scrussPosted on 02005-03-15 Categories cars suckTags car, hybrid, rentalLeave a comment on where are the hybrids for hire? Seems it’s a big weekend down at the rental lot. 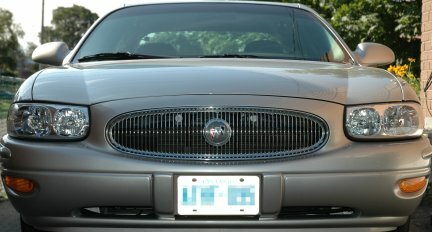 This Buick LeSabre — approximately the size of Clackmannanshire, for Scottish readers — is all they had left. Oh well, at least I’ll be stylin’ on the way to the Rennfest, and at the airport to meet Catherine. Or, since it’s about the size of a Zil, I guess I could be Stalin.